It’s great to see new versions of robot vacuums coming onto the market. The Tesvor Robot Vacuum X500 incorporates some features only available on more expensive products while keeping the price affordable. If you are turning your house into a smart home so that you can control some of your electrical goods by voice command then the Tesvor will fit right in as it will connect to Alexa and Google Home. The Tesvor X500 is circular in design. It has a diameter of 13 inches and a height of 2.9 inches which is nice and slim to get under your furniture and slimmer than a Roomba. It can make all the difference not having to move your furniture to clean the floor. It’s black in color with a start button on the top although you will probably use the remote control that comes with the robot vacuum for starting from a distance or the app. Don’t forget you can also use the voice option if you have an echo device. The Tesvor will clean hard floors and carpets although it can’t manage thicker carpets more than 0.6 inches deep. It may also struggle with dark stripes or really dark floors so it’s worth bearing in mind when looking for a robot vacuum. Laser directed options like the Neato range seem to cope better with darker floors. There is a smart mode and max cleaning mode where you can choose the fan, the max mode reaches 1500 PA suction. This allows you to select a stronger suction if you’re cleaning over carpets or specifically dirtier areas. There is a single room mode and edge cleaning too. The dust bin is located in the side of the robot vacuum which is easily removed for emptying. It has a capacity of 0.6L which is a reasonable size and bigger than some cheaper vacuums. It has a filter inside it which stops dust being blown out into the room. There is a rotary brush underneath the vacuum and 2 side brushes. This helps in picking up all kinds of dirt and can handle removing human and pet hair with no issues. With wifi connection you can control your vacuum with your smart phone. It requires it to be on 2.4GHz to work. Once you have downloaded the app you have the capability of starting your robot vacuum manually or setting a cleaning schedule so that it will set off automatically at a time of your choosing. This can be very useful if you work and would like to have your floors cleaned for when you come home. The X500 is pretty quiet when running too, only around 60 decibels so you could even set it off at night. Set it up with your voice device and you won’t need any remote or your phone to clean, just ask and it will comply with no arguments. It can clean intelligently using gyroscope technology to map a route around the room. It cleans back and forth in an efficient way in a similar way to more expensive models. It will also send you the cleaning map it uses so you can see what has been cleaned. It does have some limitations as it doesn’t hold the cleaning path in memory so it can’t return to where it finished if it doesn’t manage to clean the whole area before it runs out of power although it will return to re-charge automatically. You will get around 100 – 120 minutes of cleaning in one charge which will cover up to 1600 sq ft. The sensors will make sure that it doesn’t smash into furniture or fall down stairs. It can manage to climb up 0.6 inches onto carpets or different levels of flooring. The robot vacuum comes with a recharging dock which you should set up against a wall with a bit of space around it. That lets the unit wiggle itself onto the charging points and it gives a bit of space if it comes in at an angle. When you buy a robot vacuum like any other vacuum the main thing that has to be done is to empty the dust bin. Although the bin size on this Tesvor is 0.6L in size which is on the larger size you still might have to empty it every time you use your vacuum depending on your floor size and if you have a lot of pet hair. With mine I can get away with emptying it every 2 or 3 uses as I live in a small house. Regarding the brushes and the wheels underneath, it’s worth checking them at least once a week just to make sure they are not getting hair wrapped around any parts. It’s easy to remove the brushes if you need to snip the hair to unravel it. If you want to keep a set of spare brushes they can be purchased online. There is also a magnetic strip available that can be used to protect certain areas of your home from the robot vacuum. Place it in front of delicate floor items, around pet feed bowls or across a doorway to stop the X500 from crossing. 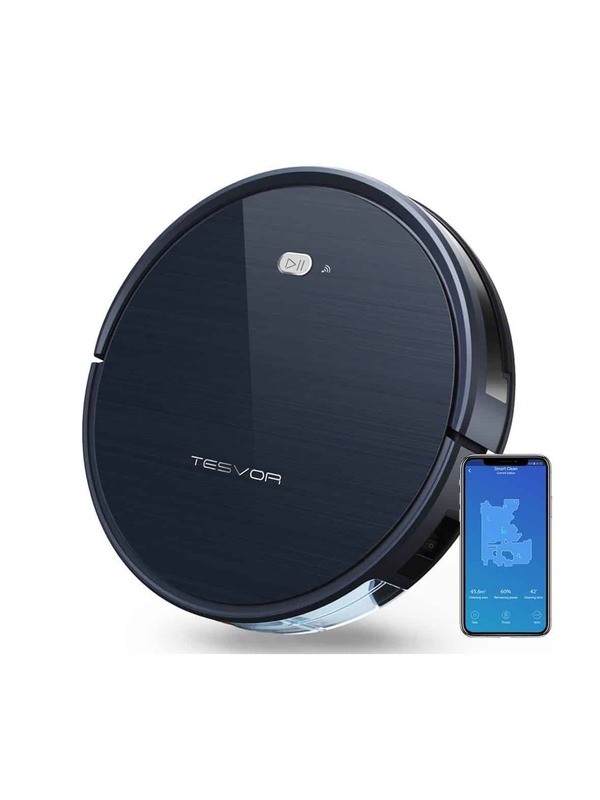 If you want to have help keeping your floor clean but can’t afford a top rated robot vacuum, something like the Tesvor X500 can bring the technology within your budget. With a price below $200 it becomes much more available for families to afford. The majority of customers are enjoying their experience with the Tesvor Robot Vacuum X500. They’re happy with the cleaning capability for the price paid. People find it quiet to have running in the background and emptying is a breeze. The smart cleaning seems to work well for most customers and being able to link to Alexa is an added bonus. Some customers have had issues, it can have problems returning to the charging dock and you may have to try a couple of different spots if this is an issue for you. This vacuum will not handle high rugs, it might struggle to get onto them so be aware, you might need something with bigger wheels to manage that. All in all this Tesvor X500 is quite a capable machine for the money. It has enough features to make it worth considering if you’re looking for a budget robot vacuum with some options that are only available on items with a bigger price tag. It can clean more floor space than a vacuum that can only do random cleaning but it’s not able to keep track of where it’s been to return to where it left off if it runs out of charge. If that’s important to you then you would need to check out other room mapping robot vacuums like the Roomba 960. Check it out at the Tesvor site for the best prices. It’s also available on Amazon.